Partner with us to become a leading supplier of the mining industry ! Structural full-scale testing of a flexible unit for anchoring was held in the mine face of the intermediate drift 322 D6-C and in the walkway for people. The Coal seam D6 in the test zone has a thickness of 4.10 m. Under uniaxial compression, the strength of the coal is 8.0 MPa. The mine face of the drift consists of argillites with the strength of 20 MPa. The base of the roof is formed of fine-grained sandstones having a thickness of up to 9.0 m and a uniaxial compression strength of 45 MPa. The first layer of the soil consists of the siltstone with a thickness of 3.4 m and a uniaxial compression strength of 45 MPa. Below this layer, there is mudstone with a thickness of 3.5 m and a uniaxial compression strength of 33 MPa. The average depth of the mine face is 500 m.
To anchor the intermediate drift 322 D6-C anchors having a length of 2.4 m each with a diameter of 22 m were used. There were 9 anchors in a row and the distance between rows was 1 m (Figure 1). The walkway for people with a slope of 125m is situated in the central part of a slope field. The cross section of the finished section is Sсв=14.4 m2. The inclination angle is 8°. The incline passes at 7-10 m below the D6 layer of the formation rock represented by the siltstones having a uniaxial compression strength of 33-45 MPa. The anchoring of the walkway is combined by the metal arch support and anchors. The density of the metal arch support is as follows: one frame per meter and nine anchors at the top of the walkway drilled in two rows in a checkerboard pattern. The length of each anchor is 2.4 m and the diameter is 22 mm. To drill holes and install roof bolts in the mine workings a “Super Turbo” bolter was used. In the course of attaching unyielding anchors in both mine workings (mine face and passage) the following was observed: a breakdown of nuts; significant deformations; a break of a mesh fence; denting of the support plate in the cutout rock; cracks in the roof; evidence of fallen rocks in the connection area of ​​the base plate with the roof; and the exposure of the lower end of the anchor. Testing was carried out with the use of anchors equipped with flexible shear tube units consisting of three breakable shear tubes with varied thickness of the walls of the tube. 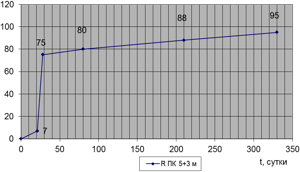 The parameters of the breakable shear tubes are shown in Table 1. The shear tubes were installed between the support plate and the tension nut. 270 anchors each equipped with a flexible unit were used to establish the intermediate drift 322 D6-C. For the purpose of the test, 30 m2 of mine area were anchored. The final inspection of bearing pressure of anchor rods in the borehole showed that they achieved a load capacity of 110 kN in 10-20 minutes after installation (which is the limit of the measurement device). The intermediate drift 322 D6-C was outside of the zone of bearing (support) pressure. In order to determine the displacements and stratification of roof rocks there were three benchmark stations installed in the testing area. Each benchmark station had two frames installed at a depth of 2.5 m and at a distance of 4.5 m from the cutout rock. Observational benchmark stations were installed on the post lines 1 (PC1 + 3m), 5 (SC5) and 16 (PK16 + 3m). During the observation period, the roof displacement in the experimental area did not exceed 30 mm. During this period the rate of displacement was constantly decreasing. The period of active displacement did not exceed two months. Benchmark stations installed at the posts, at depths of 2.5 and of 4.5m, had the same magnitude of displacement. This indicates that there was no stratification in the rock formation between these reference points. The results obtained at the walkway for people were as follows: (Figure 2). 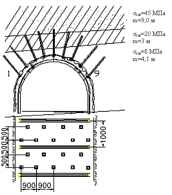 Figure 2 – The shift of the roof (U) in the walkway for people with the slope of – 125 (in the area of ​​the bearing pressure). In this mine cave there were 225 anchors each with a flexible unit and a secured 25 m2. The benchmark station was installed in the zone of the bearing pressure (SC5 + 3m). Because of the influence of the bearing pressure, there was a shift in the roof of 75 mm in the first month after the digging of the mine cave (Figure 2). The shift occurred without the stratification as evidenced by the benchmark stations installed at depths of 2.5 and of 4.5 m. Further there was a slight displacement of the rock mass and during a 300 day observation period, the displacement was only 20 mm. This demonstrates the effectiveness of the flexible unit. In both testing sites there were no observed failures of nuts, perforation or significant denting of a mesh fence or supporting tiles, or exposed lower ends of anchors or evidence of rockfall. A flexible unit improves the condition of the mine workings. The flexible unit also facilitates a smooth lowering of the mine roof; including the areas of bearing pressure by the reduction of pressure in the immediate roof rocks and increasing their sustainability. The selected design of a flexible unit is the most simple and effective. Thus, research has allowed us to develop a new technology to effectively manage the geomechanical state of the rock mass in mine workings with the use of the flexible unit for anchoring. This entry was posted in Case studies and tagged best practices of anchoring, flexible unit for anchoring. Bookmark the permalink. Sign up to follow IPKON and receive notifications about new developments in the mining industry. IPKON as the leading Underground Support Company created a revolutionary silicate fixing agent for rock bolting and provided the mining and construction sectors with new opportunities. Partner with us to become a leading supplier of the mining industry.